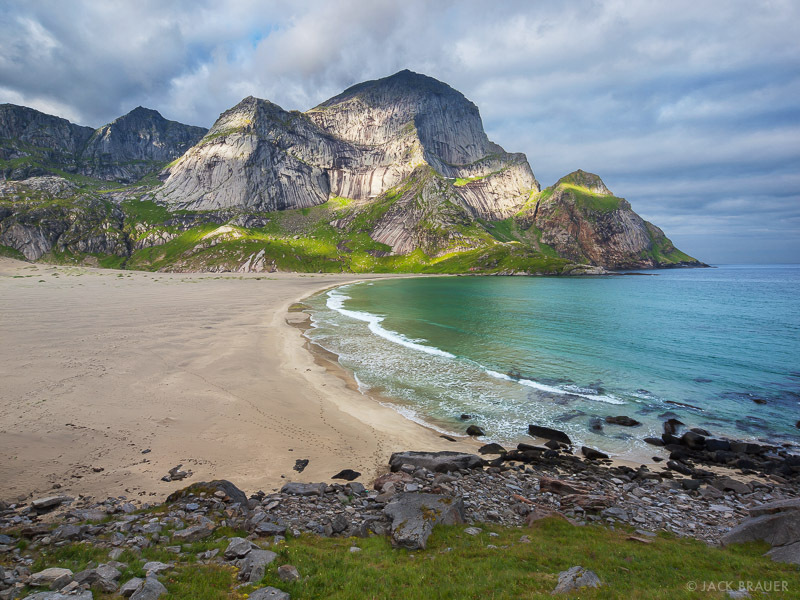 Morning at Bunes Beach on Moskenesøya Island – July. The treasure hunt continues with these photos I recently unearthed from my hard drive, from the Lofoten Islands in Norway from back in July 2009. Though I often shot with my large format 4×5 film camera here, all these photos were taken with an Olympus E-620 digital SLR. While selecting the photos to publish after this trip, I think I was initially more focussed on the 4×5 photos and/or the more colorful sunrise/sunset shots, which is probably why I overlooked these no-less-worthy daytime photos. Kjerkfjorden and the little settlement of Vindstad on Moskenesøya Island. The city of Svolvær as seen from the summit of Fløya on Austvågøya Island. You can see my gallery of photos from Norway here. You can also read my trip reports from my travels in Norway here. Posted in From the Vault, Norway and tagged Lofoten Islands, Norway on May 22, 2014 by Jack Brauer. Since I’m lacking any new recent photos to share, I dug into the “vault” and found a few unreleased photos from my 2009 trip to Norway to share. The first two are new drum scans from my stack of 4×5 film. Otertind reflects in a calm river. 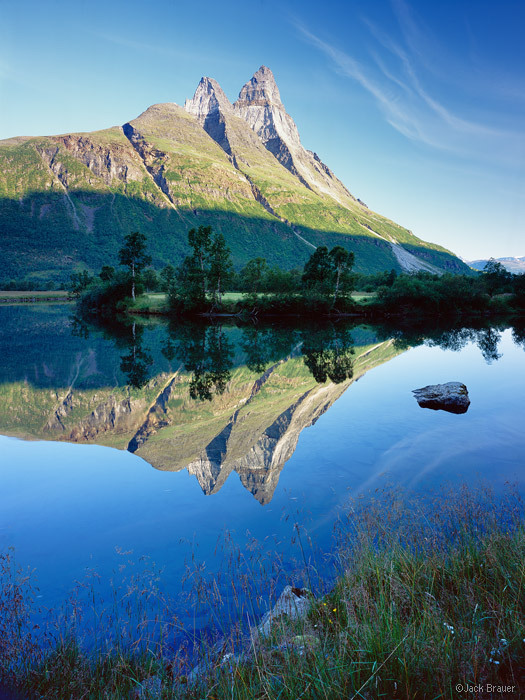 Above is the beautiful mountain of Otertind, in northern Norway, reflected in a calm river on a gorgeous blue sky morning. Otertind’s striking profile is actually more attractive from a more distant perspective. 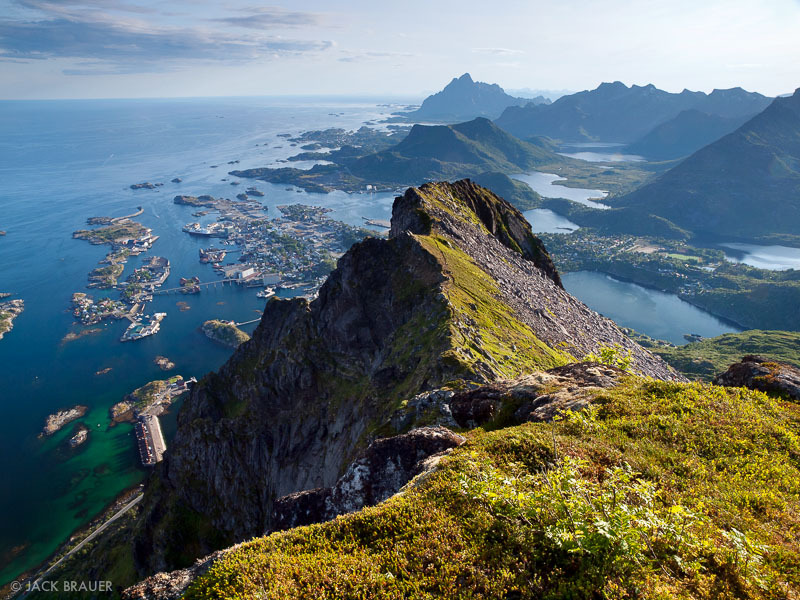 A rugged view over the Lofoten Islands, as seen from the summit of Hermannsdalstinden (1029m), the tallest mountain on Moskenesøya Island. 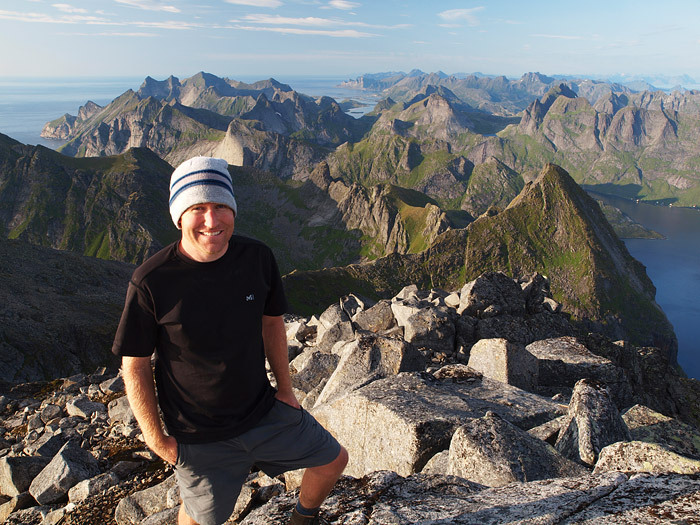 The scrambly climb up Hermannsdalstinden in the Lofoten Islands was one of the most challenging and fun hikes I did during my six weeks in Norway, and the view from the top remains one of the most rugged mountain vistas I’ve witnessed to date. This view here is only one slice of the incredible 360º panorama encompassing granite peaks, deep fjords, alpine lakes, and of course the endless ocean beyond. 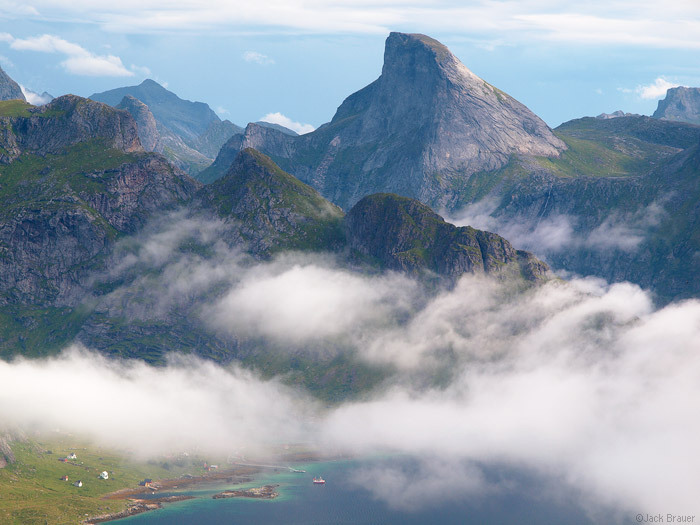 This 732m peak on Moskenesøya Island looks like a Norwegian version of Half Dome in Yosemite. Kjerkfjorden and the little settlement of Vindstad are below the clouds. 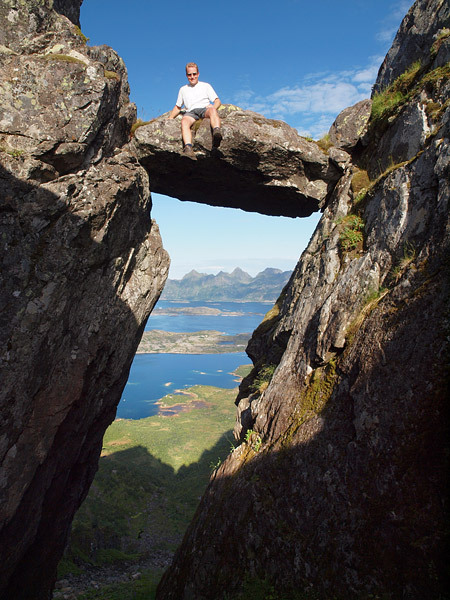 Just phenomenal scenery over there in Norway! I hope to return someday. Posted in From the Vault, Norway and tagged Lofoten Islands, Norway on December 17, 2012 May 19, 2013 by Jack Brauer. Here’s another 4×5 photo “from the vault.” This is Litlmolla island, near the town of Svolvær in the Lofoten Islands, just north of the Arctic Circle. Taken in August of last summer, during a six week trip through Norway. #2, you ask? Here’s “#1.” When I first edited my photos after the trip, I chose to post #1 in my gallery, probably because I initially preferred the warmer light on the island and horizon. However, a year later as I look at the two again, this one here is clearly my favorite. I prefer its subtle tones and softer colors, and as a whole it has a lot more feeling to it. As an extra bonus, #2 was shot on large format film (#1 was from a much smaller resolution digital camera). A photographer friend of mine Dave is traveling somewhere over there right now… I’m looking forward to seeing his photos after he gets back. 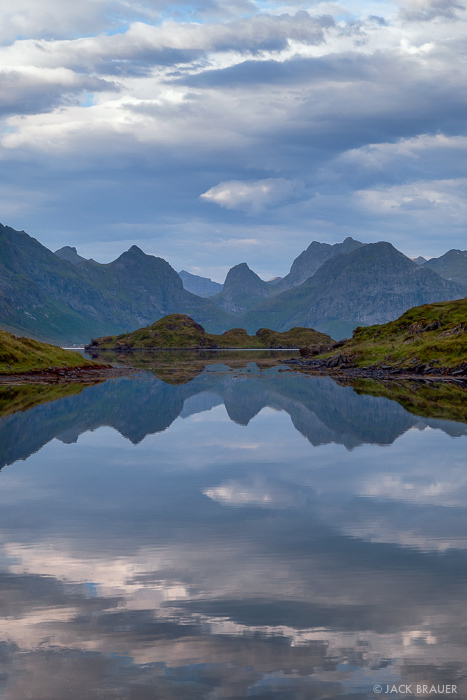 Posted in From the Vault, Norway and tagged Lofoten Islands, Norway on August 30, 2010 May 19, 2013 by Jack Brauer. The last few days I’ve been in the town of Svolvær, the largest town on the Lofoten Islands. Yesterday I did a hike up Floya, a 590m peak that juts out above the town, and watched the sunset from up top. On the way up I couldn’t resist taking this cheesy shot of myself sitting on this hanging rock! Though I could spend an entire year or two exploring the Lofoten Islands, I’ve got the itch to keep moving on, so today I’m going to continue my journey. 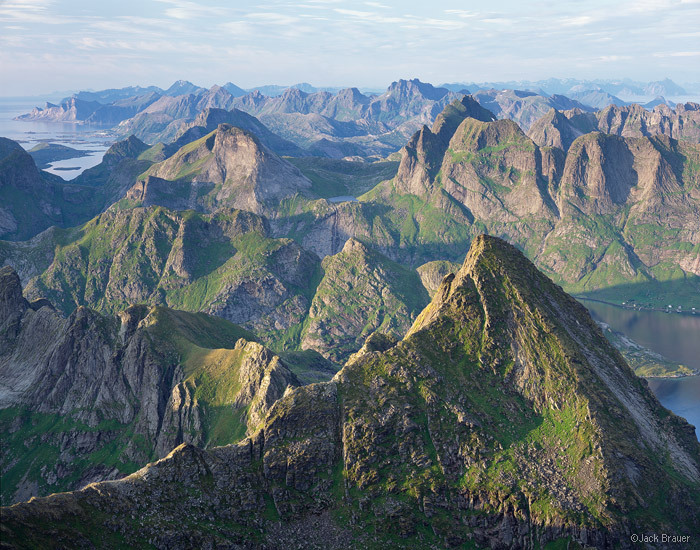 I’m headed to Tromsø, but there’s a few peaks I want to photograph on the way, so it may take a few days to get there. 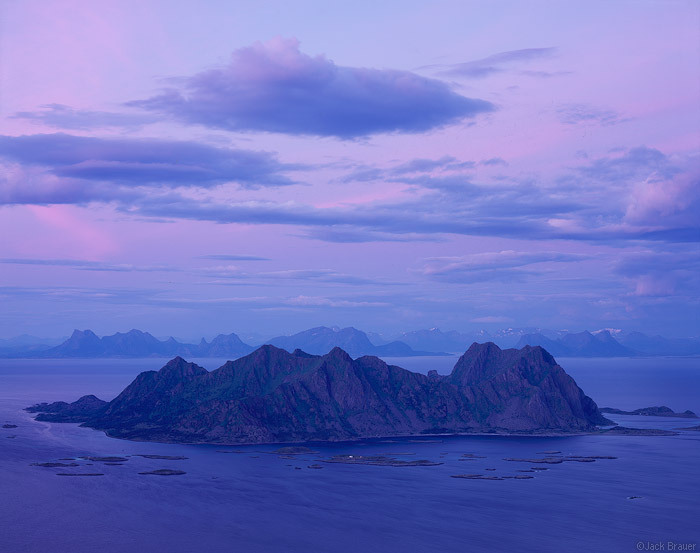 Posted in Norway and tagged Lofoten Islands, Norway on July 31, 2009 May 22, 2014 by Jack Brauer. For the last week or so I’ve been doing my thing here on Moskenesøya, one of the Lofoten Islands, with some of the most unique and incredible landscapes on Earth! The mountains soar up right out of the ocean, with sheer granite faces leading to symmetrical pointy summits. 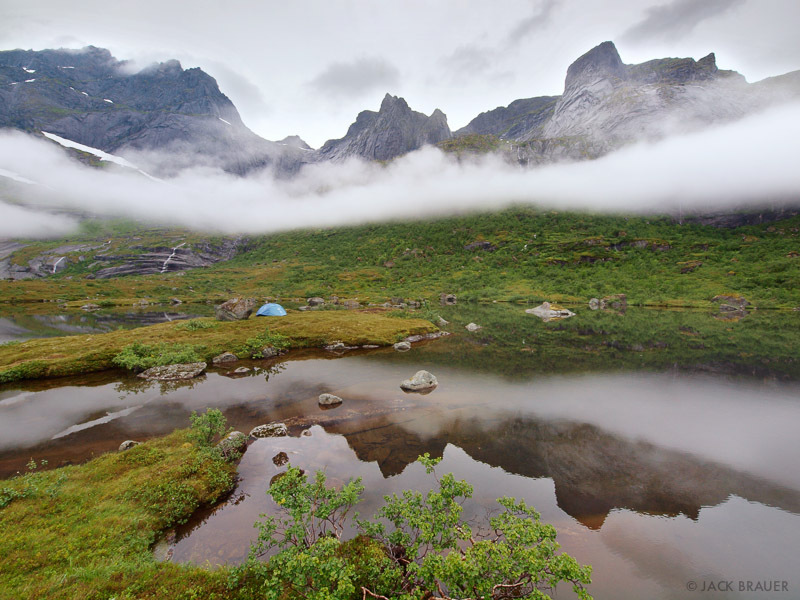 The mountains are covered in lush green tundra, and there are also lots of fjords, lakes, and even some beaches! There are also lots of tourists, at least compared to the other places I’ve been in Norway so far. All the little fishing village cabins are occupied (not that I could afford those anyways), so I’ve mostly just been camping out. Usually I just find a spot off the road and pitch my tent, and every third or fourth day I stay in a real campground so that I can restock my supplies and take a shower. I’ve realized though that the key to camping here is to be willing to walk and camp just a short distance from the car. 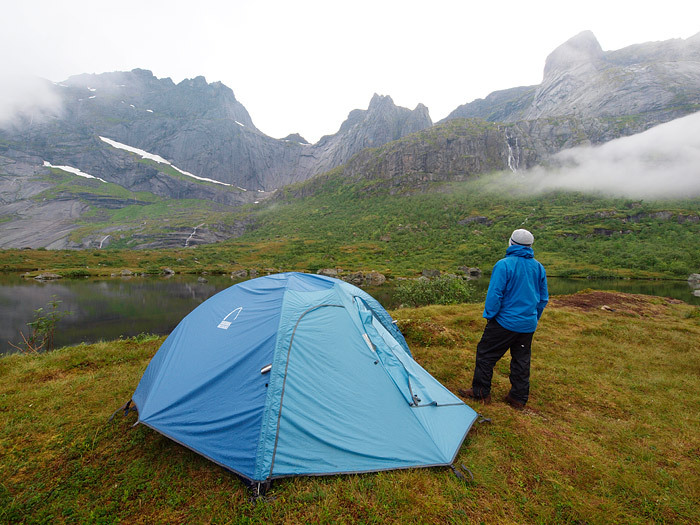 The roads here pass by so many awesome cirques, many of them with lakes, and by walking just a little ways, like maybe just a few hundred meters, you can camp in places that would be worthy destinations in the most remote mountains of the world. A few nights ago I spent a couple nights camped on a little peninsula that jutted out into an emerald lake surrounded by a towering cirque that looked like something you’d find in the Wind River Range of Wyoming. I was so absorbed in the scenery I felt like I was deep in alpine wilderness; a seagull passing by snapped me back to the reality of the location, then I looked back to see my car about 150 meters away! Unreal. I also made an expedition to watch the sunset from Hermannsdalstinden, the tallest peak on this island at 1027m. The hike was pretty tough, with lots of ups and down, ending in a really steep and exposed scramble up the summit ridges and boulders. The view from the top, though, was perhaps the most wildly rugged mountain vista I’ve ever laid eyes on, all rising right up out of the sea. I hiked down in the bright twilight after the sunset, and the sun started rising just as I got back to camp. I’m loving these long arctic days. Finally, I backpacked to Bunes beach and camped there for the night. It’s a large sandy beach surrounded on both sides by towering granite peaks… really a unique place. Now I’m slowly making my way north through the Lofoten Islands; my plan is to eventually end up at Tromsø and check out the wild mountains around there. 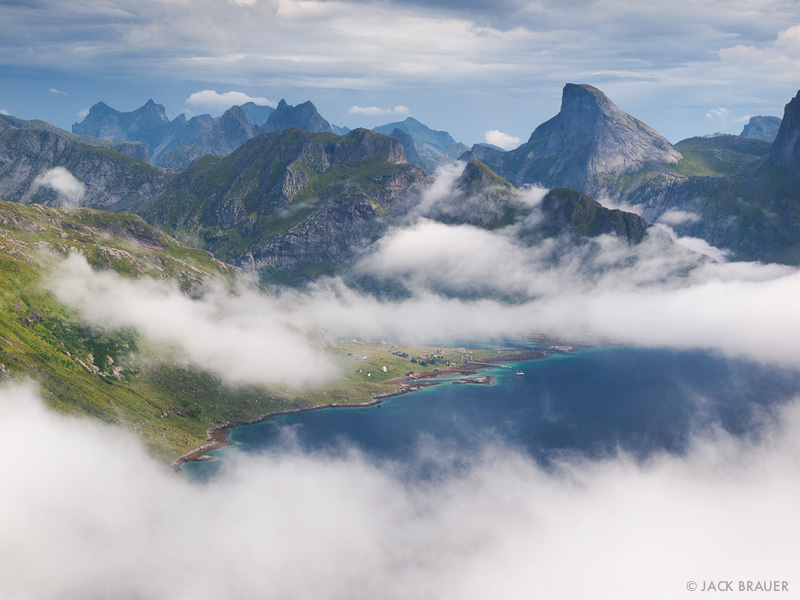 Posted in Norway and tagged Lofoten Islands, Norway on July 29, 2009 May 19, 2013 by Jack Brauer.